US President Donald Trump's decision to pull out of the Trans-Pacific Partnership (TPP) trade deal will inevitably put a similar deal with the European Union on hold, but Trump will still go ahead and broker other trade deals that continue to favor US multinationals, Sputnik has been told. 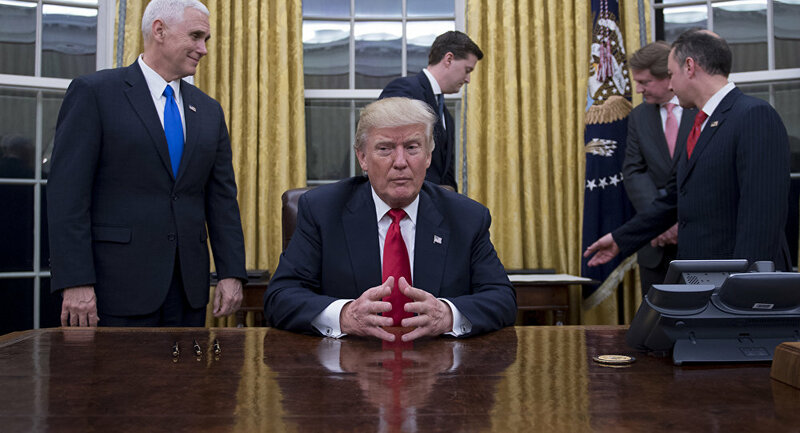 Trump signed a presidential memorandum withdrawing from the TPP trade deal — with Japan, Malaysia, Vietnam, Singapore, Brunei, Australia, New Zealand, Canada, Mexico, Chile and Peru — within hours of his first full day in office. "It is the policy of my Administration to represent the American people and their financial well-being in all negotiations, particularly the American worker, and to create fair and economically beneficial trade deals that serve their interests. Additionally, in order to ensure these outcomes, it is the intention of my Administration to deal directly with individual countries on a one-on-one (or bilateral) basis in negotiating future trade deals," Trump said. ​It was a mark of his presidential campaign that he would favor home workers and discriminate against cheap labor being used to manufacture goods imported into the US — even by US owned companies. However, campaign groups say he will now embark on a series of deals with individual countries — the UK likely being the first — which will still favor US interests over others. "TPP was a bad deal, that would have pushed a corporate deregulatory agenda in all the countries involved, not just the US. However, without a commitment to a fair trade policy that supports decent jobs, wages and public services, protects the environment, climate and health, and is developed democratically and transparently, we will just get more and more toxic trade deals," Jean Blaylock, policy officer at Global Justice Now told Sputnik. "Trump's naked appeal to nationalist sentiment in his inaugural speech reinforces his view that trade is a matter of win or lose, not of mutual exchange and benefit. He only cares that the US and US companies should win, at the rest of the world's expense. The similar rise of nationalism and insularity in the UK and elsewhere in the world paints a future of ever more cutthroat trade deals that benefit corporations at the expense of people and the environment everywhere," she said. One of the most controversial aspects of both TPP and the proposed Transatlantic Trade and Investment Partnership (TTIP) between the US and the EU is the mechanism for resolving issues where a country bars certain goods or services — for environmental or health reasons, among others. An example is US meat, where growth promoting hormones are commonly used and chickens are washed in chlorinated water before packaging — neither of which are currently allowed in the EU. A US producer, would be able to bring an action for loss of profits under the investor-state dispute settlement (ISDS) mechanism — a trade tribunal outside of sovereign judiciaries. "Trump's nominee for Commerce Secretary, Wilbur Ross, who is expected to shape trade policy for the new administration, has already told Congress that he wants to do bilateral trade deals which he sees as easy and quick. He wants to present other countries with a take it or leave it model that includes stronger 'enforcement mechanisms' than previously — which means worse ISDS," Blaylock told Sputnik. ​"Trump's administration is made up of multi-millionaires and billionaires from multinational corporates and will inevitably act in the corporate interest. Wilbur Ross, who is expected to shape Trump's trade policy, has been criticized for making his fortune asset stripping failing companies, without regard for jobs, pensions or safety standards," Blaylock added. Can You Kill a Corpse? Trump Leaves TPP - What's His Economic Policy?